TORONTO , Feb. 28, 2019 /CNW/ - Anaconda Mining Inc. ("Anaconda" or the "Company") (ANX.TO) (ANXGF) is pleased to announce the final results from the 10,000-metre drill program that began in July 2018 at the Goldboro Gold Project in Nova Scotia ("Goldboro"). Anaconda drilled four holes (BR-18-64 to 67), totaling 1,456 metres (the "EG Drill Program") to extend the existing Goldboro Deposit towards the east along strike. The EG Drill Program successfully intersected the host fold structure, alteration and mineralization 100 metres east of the current Mineral Resource within the East Goldbrook Gold System ("EG Gold System"). Anaconda also encountered five occurrences of visible gold (Exhibit A, B). 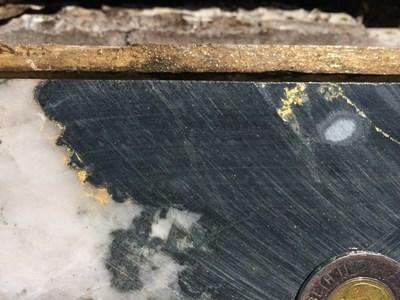 The EG Drill Program intersected a high-grade mineralized zone which included 25.70 grams per tonne ("g/t") gold over 1.5 metres and 8.00 g/t gold over 3.2 metres up plunge from very high-grade historic assays including 215.74 g/t gold over 3.7 metres (the "High-Grade Zone") (See photo in Exhibit C). The High-Grade Zone plunges moderately to the east and is located on the south dipping limb of the host fold structure. It extends for at least 150 metres and is open down plunge. High-grade plunging chutes are common at Goldboro , having been intersected elsewhere in the deposit. Furthermore, numerous other mineralized zones were intersected along the south limb of the EG Gold System outside of the High-Grade Zone, with further drilling planned to confirm the geological model for these zones. A table of selected intersections from both recent and historical drilling are shown in the table below. "These drill results continue to demonstrate the expansion potential of the Goldboro Deposit as well as the ability to locate pockets of very high-grade continuous mineralized zones. The results from the EG Drill Program, taken together with historical drilling in the East Goldbrook area, indicate that there is a very high-grade zone of at least 150 metres in plunge length, which remains open for expansion down plunge. In our upcoming 5,000-metre drill program, we will take a closer look at this high-grade area to see if we can define it better. With all results received from the 10,000-metre drill program, we are incorporating them into an updated Mineral Resource estimate currently underway by WSP Canada Inc. We expect to publish a new estimate by the third quarter." The Company will initiate a 5,000-metre drill program at Goldboro beginning in March. The drill program will focus on expansion drilling in the EG Gold System with the goal of growing resources and better defining the extents of the high-grade plunging chutes intersected in the recent EG Drill Program. The drill program will also focus on infill drilling portions of the Boston Richardson Gold System with the goal of converting high-grade Inferred Resources to Indicated Resources. The 5,000-metre diamond drill program will be funded using the proceeds of a flow-through financing completed in July of 2018. Anaconda Mining is a TSX and OTCQX-listed gold mining, development, and exploration company, focused in the prospective Atlantic Canadian jurisdictions of Newfoundland and Nova Scotia . The Company operates the Point Rousse Project located in the Baie Verte Mining District in Newfoundland , comprised of the Stog'er Tight Mine, the Pine Cove open pit mine, the Argyle Mineral Resource, the fully-permitted Pine Cove Mill and tailings facility, and approximately 10,150 hectares of prospective gold-bearing property. Anaconda is also developing the Goldboro Gold Project in Nova Scotia , a high-grade Mineral Resource, subject to a 2018 a preliminary economic assessment which demonstrates a strong project economics. The Company also has a wholly owned exploration company that is solely focused on early stage exploration in Newfoundland and New Brunswick .